The Nest , 171 McManus St, Whitfield, Cairns. A special close up and intimate concert in the warm cafe vibe of The Nest. Situated in the creative Whitfeild neoighbourhood, The Nest cafe has been a local hotspot since it's opening earlier this year. I'm very happy to be invited back for a fun and special night - sshhh - it's the owner Sue Day's birthday. James Cook University Design and Creative Arts presents ‘Light Moves’. A world of cosmological reflections told through the medium of projected light, dance and music. Light Moves is a pop up performance featuring projection, dance and music presented on the banks of Lake Placid. Featuring a series of episodes moving between shimmering Indigenous rock art adapted for animation and projection, roving light performers, live musicians and Indigenous dancers. The stunning natural spectacle of Lake Placid is the ambient scene for a mountain projection across the water and the natural amphitheatre of the recreation reserve provides the stage for an intimate encounter with the living spirit of this Bama story place. If you thought only angels play harp - think again. Cairns' treasure trove of harpists share their stories through music: from delicate to dramatic and even groovy. Vibrant strings and soulful vocals will resonate through the night. Featuring a colourful mix of fresh, seasoned and original artists. Ft. Astrid Elika, Simply Deb Robinson, Elly Little, Joy Zahner, Natalia Mann, Visnja. Proudly presented by Cairns Harp Connection. I'll be joining Tropical FYAH on the mainstage = think Dancehall meets Afrobeats, Calypso meets Reggae , Soca meets Latin sounds, Tropical meets tribal. This is what you get when you mash some Afro and Carib styles together. Resonance Art Ensemble - Launch! An evening concert presentation of large screen artwork projections as a live score, cultural film premiere, and culinary art from Indigenous Australian and Pacific Island artists. 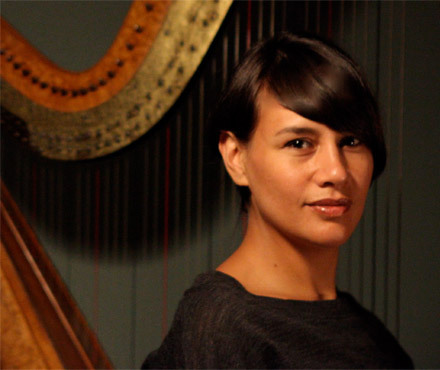 The Resonance Art Ensemble, led by harpist Natalia Mann, launches in collaboration with renowned artists Samuel Tupou and Bonemap, as they play live improvised music to artworks. Featuring Mike Rivett and Leon Tussie. Story telling by Indigenous knowledge holder Victor Steffensen explores ancestral connections worldwide. Film maker Sio F. Tusa premieres a new short psychological drama, the story of a young Pacific Island dancer. Plant Based Native a new culinary project by Lia Pa’apa’a explores culture and ancestry to create healthier lifestyles for family and community. Resonance music responds to the universal idea that all the world is vibration. If so, then as musicians we can engage with that. Using the language of art and nature, and the language of heart and spirit, resonance music is a deeply connective journey of discovery. This performance explores calling country back to health through the resonance of music. A re-engaging and honouring of sites. A discovery of what lives within. Jaye Harris's yoga classes nourish the body mind and spirit. In her grounded and flowing manner she delivers a yoga session which honours us and our connection to the moon. This full moon is in Capricorn - Knees, joints, backbone, spinal muscles, patella, bones, tendons and ligaments, skin, hair, spleen, the organ of balance. I love to accompany these classes with healing harp music, following the yogic movements, allowing the music to flow into heart and spirit spaces, encouraging release, renewal and rejuvenation. After a decade the members of Brown Roots re-gather to share stories of culture, family, love and art. As part of BlakDOT Gallery Blak Cabaret, Grace Vanilau (vocal, spoken word) and Nala Taukilo (vocal), Natalia Mann (harp), Mark Vanilau (vocal, keys, guitar) , Micka Taukilo (percussion) share the love again. Brown Roots Pacific Arts Collective was formed in Melbourne in 2002 as a response to Pacific youth crime stories. The collective hosted cultural arts workshops and gatherings to connect and inspire. The Brown Roots Collective band was formed as part of this. Healing Day in support of Rosies - Friends on the Street, who support people who are marginalised, abandoned, or socially isolated within our communities. On this beautiful Sunday, ten healers of varying disciplines will gather at Yorkeys Yoga Studio and offer free healing sessions in return for a donation to Rosies. I'll be playing harp for the event. There will be voice shamanic healing, drum sound energy healing, kinesiology, iridology, the Bars, tarot and more. Natalia Mann and Deline Briscoe interpret the work 'Flow' by Rob McBurnie in a musical performance of voice and harp. 'Flow' is part of the 'Head in the Clouds' exhibition featuring works by Rob McBurnie, Ben Trupperbaumer and June Tupicoff. Digital mapping installative performance in collaboration with Bonemap, based arround the Torrid Zone theme of the Kickarts 25th anniversary and annual members exhibition. An album by RIchard Nunns, Natalia Mann, David Long. Films by Natalia Mann. Meeting for the first time through the recording of UTTERANCE, David Long & Natalia Mann discovered a seamless synergy in improvisation. Traversing wide frontier soundscapes, the two musicians weave new textures through their combined artisty. Jeff Henderson compiles an exhibition of sonic writings by Richard Nunns. David Long & Natalia Mann perform UTTERANCE, with installation films. Natalia Mann (lyre), Jo’el Komene (taonga pūoro) & Sundus Abdul-Hadi (sound & images from the series Warchestra). Documentary by Tessa Blackett. One year after it's premiere the artists come together again to celebrate Te Pūru (the bull), the sacred golden head bull-lyre made by John Knotts. I'll be joining Bic Runga, iconic NZ pop artist, in her 4 piece band for these Australian concerts. A generous evening of timeless hits and beautiful songs. 20h Vendredi 10 mars et 18hr Samedi 11 mars . Artist in Residence @ Centre Culturel du Mont-Dore, Noumea, New Caledonia. Tyssia Wahnawe with Association de SIAPO and Centre Culturel du Mont-Dore present Fames Croisees, connecting women artists in New Caledonia from across the globe. Together they share passions, artforms, music, song ,poetry, dance. A rare opportunity to hear Ros perform in Australia on the tarhu with some of the collaborating artists from the CDs, celebrating 10 years of her work in a short concert. First launched in Hania, Crete. Entry by Donation and all proceeds and CD sales to Global Youth Citizens Crete. Lorraine Biggs, Lila Meleisea, Dane Chisholm - Three artists explore the magnificent Tasmanian Blue Tier highland forest in this exciting hybrid show. Exhibition to be opened by Jonathan Kimberley, with guest musicians Natalia Mann, Karlin Love, Liam O'Leary, Robbie Cameron and Simon Homes. The online Virtual Harp Summit is hosted by Diana Rowan. The theme is Expression & Creativity. This is a rare opportunity to spend an hour with 25+ creative harpists - all very different and from all over the world. It's all online and FREE for September 14-20. Register for the Virtual Harp Summit by clicking the link. If you missed the free online broadcast, you can still access the event by purchasing an all access pass. Performing the Hip Hop Harp Concerto composed by Irine Vela, together with talented singers, poets, rappers, actors & instrumentalists from the globe's far corners comign through Melbourne's outer suburbs. An Outer Urban Projects production. Raising funds for civil rights defenders & survivors around the world. Calling for the abolition of nuclear arms, remembering Hiroshima. Sound n Colour rock out for the Environmental Defenders League. Featuring special guest Sydney/Istanbul songwriter Behiye Suren. Performance of a piece co-written with electronic producer Paddy Free, for the legendary NZ international Wearable Art fashion show and awards. Director Malia Johnson. Outer Urban Projects presents eight spoken word artists speaking stories of migration and misunderstanding, hope and frustration. Classic Greek oratory blends into hip hop, underscored with harp & guitar, directed by Irene Vela. Celebrating the launch of an historic book about traditional fire in Australia, Cape York area. Photographed and compiled by Peter McConchie, text transcribed from Traditional Owners from Far North Queensland. Foreword by Don Hankins. @ The Ballroom, Four Seasons Hotel, The Rocks, Sydney, Australia. Tickets $20 at the door. A late night jazz performance for the World Harp Congress; a special performance with harp, movement, voice and percussion, with a contemporary Samoan perspective. An electro-acoustic sonic journey composed by Ros Bandt for the World Harp Congress. An immersive work for eight harpists and soundscape. Performing with Grace Vanilau, Aniva, Suga. In the month of ‪#‎Naidoc‬ celebrations come and experience an intimate evening of ‪#‎poetry‬ and ‪#‎spokenword‬ from some of Melbourne’s known and unknown Indigenous and non-Indigenous wordsmiths @Incinerator Gallery. Featuring Birdz, Jessie Giles, Helen Kassa, Grace Vanilau, Jacky T & MC’d by Morganics. — with Jessie Giles - Dust for the Dancers. The Spoken Word and Poetry Night is an event which is part of the ‘Beyond the Surface’ Group exhibition, co-curated by the Incinerator Gallery and our beautiful sister Hannah Presley an exhibition of recent work by Indigenous artists from South-eastern Australia. The exhibition of contemporary and traditional Indigenous art forms draws on the idea of deep listening, which can be understood as ‘listening from the heart’: a form of meditation or contemplation that is an integral part of Indigenous culture. Various concerts in residence with Siapo Arts Collective. Songstress Tyssia Gathau and Natalia Mann share their music in celebration for International Womens Day. A big festival day including Australian aboriginal musicians Victor Steffensen and Astro Brimm, poet and author Antonio Te Maioha, singer Tyna Keelan , kapahaka groups, discussion forums, documentary and film screenings, and more. Ms Bic Runga and the band for this little festival is Kody Neilsen, Natalia Mann, Michael Barker. Creative and experimental music, international collaboration with Fatos Qerimaj (Albania), Alain Aubin (Marseille), Martial Paoli (Corsica), Jean-Claude Martin (Lyon), and the Leda Atomica artists Phil Spectrum, Marie Demon, Alain Bordes and the spectrum family. Performance and acceptance of Iosefa Enari Award for achievement and development in music. Very excited to present at the AKBANK Jazz Festival in Istanbul. Explorations on inspirations. Saturday 10 August 8:00pm, 2013. Saturdays - July 13, 20, 27 August 3, 17, 24, 31, September 7, 14. Learn to unleash your own personal creativity in music. I will guide you through techniques to help you develop the art of improvisation on your own terms. Develop confidence as a solo and group player. You don't have to know how to improvise, or read music or charts. The classes will enrich every type of music study. Come with your instrument and an open mind! Open to all ages and levels of proficiency. Each week we'll focus on a different skill. You are welcome to come to all classes or drop in on one or a few. Natalia Mann & Horomona Horo weave together the atmospheric subtleties of harp and taonga puoro. Creative Harp Studio workshop 11:00am -12:30pm. Taonga Puoro workshop 12:30-2:00pm. Concert 7:00pm. Richard Nunns (taonga puoro) and Natalia Mann (harp) are joined by throat singer Jonny Marks. A stunning combination of sounds in a perfect acoustic space. A very special concert of exploratory and contemporary music inspired by radical traditions in music and spirituality, featuring a diverse programme from traditional (Gregorian chant, medieval polyphony, taonga puoro, throat singing) to contemporary (noise, drone, contemporary composition, improvisation and video art). Including Ming (Campbell Kneale and Ellen Rodda), i.ryoko, Gerard Crewson, Henare Walmsley, Saint Cosmos, Olivia Webb, The Saint Mary of the Angels Choir. An amazing day where we get to pay living tribute to our great mentor and friend Dr.Richard Nunns, and to the huge and valuable effect he has had on the music of Aotearoa in the continuing revival of Taonga Puoro, and his generous and adventurous spirit which keeps us pushing onwards in research. Performers include Mike Nock, Horomona Horo, Ariana Tikau, Paddy Free, Charles Royal, Nga Tae, King Kapisi and Teremoana Rapley, Alexa Still, Aroha Yates-Smith and a lot more. Arohanui. A fun night in Paekakariki. An acoustic performance in musician Paul Kimmels special home concert series - Temple of Melodious Sound. Kala Box Studio is a community art centre which provides space for local artists and youth projects. Come along and help raise funds for the continuation of this valuable community meeting place. A benefit concert featuring amazing Melbourne sisters, raising awareness and funds to help other sisters in less fortunate circumstances around the world. Using the surprisingly textured sonic medium of cut paper, sculpted in real time by Lauren Simmonds, improvised sound performance with Ros Bandt on tarhu and psaltery and myself on harp. Merging art, music, installation, movement. Suga perform with gorgeous hula & siva dancer Fipe Keanu on Friday night at the Seven Sisters holistic festival weekend. On Saturday and Sunday Fipe will lead her magical hula dance workshops and Suga will teach rhythms and song. I'm so excited to be reunited with the SUGA sisters, and to be performing together at this milestone festival for Pacific arts in Melbourne. There will be so many great artists - beautiful art works, music, dance, workshops, symposiums. Always a pleasure to sit in with this wonderful orchestra! Playing a program of Ravel and Scriabin. Tomtom Mahallesi, İstiklal Caddesi, Acara Sokak 5/B, Beyoğlu, Beyoğlu. Phone: (212) 244 85 67. This evening will be a different and special program. In the first half, as a duo, Natalia Mann and Izzet Kizil will be playing the music of Pasif.ist. In the second half, we will be joined by heavyweight improvisors Korhan Erel and Alper Yilmaz for what we think will be a very nice meeting in improvisation. This will be our last Istanbul concert for a few months. Join us! Bu gece iki değişik ve özel bölüm olacak. İlk sahnede Izzet Kizil ve Natalia Mann Pasif.ist müziğini duo olarak calacak. Ikinci sahnede kocaman improvisazyon ustalar Korhan Erel ve Alper Yılmaz ile beraber bizce çok hoş bir toplantısı olacak. Birkaç ay için, Istanbul'un son konserimiz olacak. Bekleriz. SPACE HARP no. 1 Kat.2, no.3 Karabaş Küyü Çıkmazı, Tophane, Beyoğlu, İstanbul. I am thrilled to introduce the first installation of Space Harp. Space Harp is a physical extension of the harp off of the instrument and into the space. Utilising the chance composition techniques of John Cage, the room is strung in cosmic proportions. A silent work. Explorations. JeanSanat Sahne, Taksim Istanbul. NATALIA MANN harp, IZZET KIZIL percussion, MATTHIAS MAINZ trumpet. Experimenting with the present moment, harp and percussion, and especially pleased to be joined tonight by Matthias Mainz, visiting from Germany. Natalia Mann - Pasif.ist. Alt. Jazz Club, Acara Sokak, Istiklal, Taksim. IZZET KIZIL (percussion), SERCAN HALILI (klasik kemence), CEYHUN KAYA (uflemeler), ABDULLAH SHAKAR (bass). The pasif.ist ensemble blending ideas from east and west folk, urban, classic, with the universal resonance of improvisation. Natalia Mann - Pasif.ist. Cafe Mittani, Cihangir, Istanbul. IZZET KIZIL (percussion), SERCAN HALILI (klasik kemence), CEYHUN KAYA (uflemeler), ABDULLAH SHAKAR (bass). Last concert for the year at groovy Cafe Mittani. SOUTHERN BELLS - Guneyin Çanları. Istanbul Live, Taksim. AYSU COGUR, BEHIYE SUREN & NATALIA MANN. Three creative musicians from Australia, each songwriter/composers in their own right, combine their talents to create a warm, fun evening of beautiful music at Istanbul Live. Voices, harp, drums, guitars and loops colour original songs and improvisations. Natalia Mann Trio Alt. Jazz Club, Acara Sokak, Taksim. Considering the poetry of music in a new project with bassist DINE DONEFF (aka Kostas Theodorou) from Greece, and percussionist IZZET KIZIL (Istanbul Sessions). We'll be joined by special guest avant garde saxophonist ROBERT REIGLE (Islak Kopek, MIAM).